Born in the early-1800s, Boaz Mahune was a member of the lesser strata of Hawaiian nobility, subordinate to the high chiefs or aliʻi. He was a cousin of Paul Kanoa, who served as Governor of Kauaʻi from 1846 to 1877. Boaz Mahune was a member of the first class at Lahainaluna Seminary, graduating in 1835 after four years there. His classmates included historian David Malo and royal diplomat Timothy Haʻalilio. He was considered one of the school’s most brilliant scholars and was one of the ten chosen to remain as monitors, teachers in the children’s school and assistants in translating. 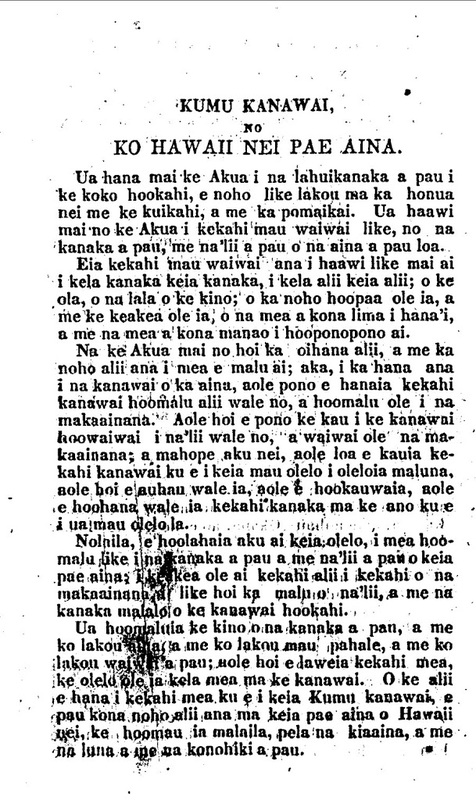 Mahune (with others from Lahainaluna) drafted the 1839 Hawaiian Bill of Rights, also known as the 1839 Constitution of Hawaiʻi. This document was an attempt by King Kamehameha III and his chiefs to guarantee that the Hawaiian people would not lose their tenured land, and provided the groundwork for a free enterprise system. It laid down the inalienable rights of the people, the principles of equality of between the makaʻāinana (commoner) and the aliʻi (chiefs) and the role of the government and law in the kingdom. After several iterations of the document back and forth with the Council of Chiefs, it was approved and signed by Kamehameha III on June 7, 1839 – it was a significant departure from ancient ways. As you can see in the following, the writing was influenced by Christian fundamentals, as well as rights noted in the US Declaration of Independence. The Declaration of Rights of 1839 recognized three classes of persons having vested rights in the lands; 1st, the Government; 2nd, the Chiefs; and 3rd, the native Tenants. It declared protection of these rights to both the Chiefly and native Tenant classes. Mahune is more specifically credited with nearly all the laws on taxation in the introduction to the English translation of the laws of 1840, not published until 1842. Later he was Kamehameha III’s secretary and advisor. When the king attempted to start a sugar cane plantation at Wailuku on Maui, Mahune was the manager. The project was not a success. Mahune returned to Lāhainā, where he acted as a judge for a time. About 1846 he went back to his home in Honolulu to work for the government. Mahune died in March 1847. The image shows the 1839 Declaration of Rights. In addition, I have included other related images in a folder of like name in the Photos section on my Facebook and Google+ pages.